A crystal ball is believed by some people to aid in the performance of clairvoyance like witches and wizards. I was introduced to how to use them photographically by Auburn Photography Club member Don. 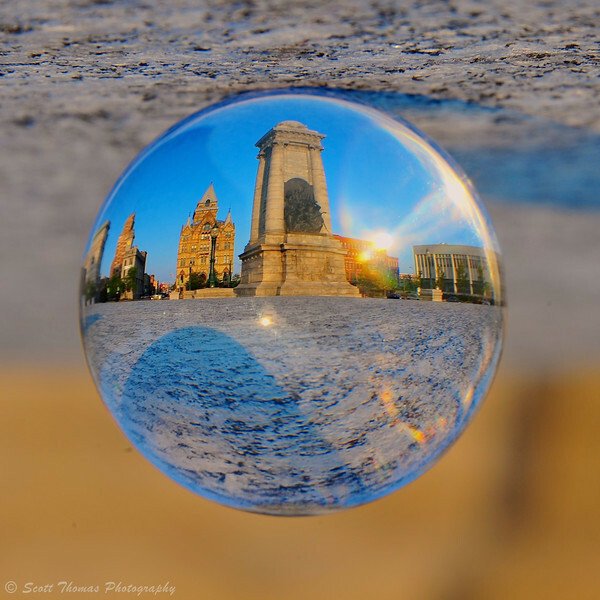 Clinton Square in Syracuse, New York through a Crystal Ball. Nikon D700/28-300VR, 1/80s, f/18, ISO 200, EV +0.7, 300mm focal length. 1. Things are upside down or inverted when looking through a crystal ball so you must flip them in your photo editor (see below). 2. 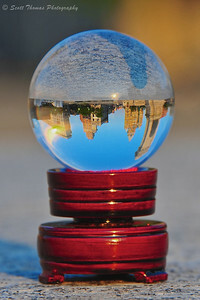 Focus sharply on the crystal ball image and let the background go out of focus. 3. If you can not levitate the crystal ball (man, I wish I could learn how to do that! ), find a secure place for the crystal ball. An assistant to hold it would be perfect (see Don’s photos). 4. Lens choice is up to you but one’s that can focus closely are easier to use. 5. Be careful when using a crystal ball in the Sun. They get very hot, very fast! 6. Find an interesting subject like maybe a fantasy castle. 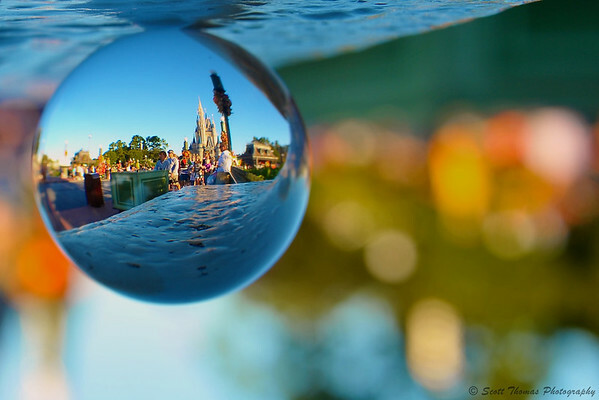 Cinderella Castle through a crystal ball in the Magic Kingdom, Walt Disney World, Orlando, Florida. Nikon D700/28-300VR, 1/200, f/7.1, ISO 200, EV +0.3, 68mm focal length. If you would like to procure your own crystal ball, check out the Crystal Company and have some fun! This entry was posted in Weekly View and tagged 28-300mm, clinton square, crystal ball, crystal company, florida, new york, nikon D700, orlando, syracuse, vr, walt disney world. Bookmark the permalink. Great stuff! Like dewdrops and raindrops on steroids! Will bring the crystal ball with me on my next Ithaca visit. What kind of camera do you have, Sybil? All it needs to do is focus on the ball. OMG!!! WANT WANT WANT WANT WANT!!! I am SO putting this on my Christmas List! LOL…it would make a great stocking stuffer, KD. Way cool! Really neat idea! Ditto what KD said up there! Gee, I hope you all reference my website when you order. Should make for some fun winter photography projects. Pardon me, forgot to say the main point. I LOVE IT!! Can you teach me, Kathy? 🙂 Thanks for loving it! Sweet! I almost bought one of those crystal balls in NYC years ago, but I could see the seam inside it and felt that it had to be kind of a fake. Now I’m wishing I’d gone ahead and bought it. This is a glass ball so no seams. Yup, I need to buy one of these some day. Thanks, Tracy! It is a fun to play with. You have way better toys than i do. I wanna come play at your house. Gerry, you are always welcome to come over and play. I never knew, this is so neat. I love the last image. Know that you do, will you try it? SOOOO Cool! I want a crystal ball, too! Well, maybe I should go into the crystal ball business! I left the blogosphere for a while, but glad I came back to check on you. I love the crystal ball shots! Of course now I want one of my very own.